Every other day, a new "hero" appears on the scene, declaring that he will save the miners. These false saviours can do little more than stand and watch as our brave soldiers destroy the wicked bots and bot-aspirants. Twitchy McTwitch learned a harsh truth about game mechanics and about the Knights of the Order. Our battles are always brief, but eventful. It's hard to intervene. 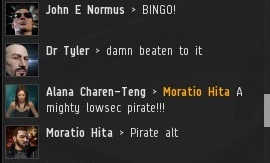 In Twitchy's defense, Moratio Hita was probably AFK, which makes it difficult to call for help. Nothing wakes up an AFK miner quite like having his ship go boom. Moratio declared himself a dangerous rogue--someone you wouldn't want to meet in a dark alley of lowsec. Much to his surprise, the New Order Agents he threatened had heard it all before. It's funny, isn't it? You'd never suspect that everyone mining in the ice field is a fearsome pirate. 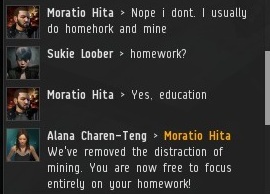 Moratio protested that he wasn't really AFK, he was just busy doing homework. Agent NoseCandy tried to teach him a thing or two about arithmetic. Apparently math isn't Moratio's best subject. He vowed revenge. What horrors would his "main" unleash? Had the New Order finally met its match? Moratio chose not to unveil his main just yet. Instead, he decided to go the more popular route and whine in local about our cowardice. He couldn't be further from the truth--the New Order walks all over highsec each day with growing confidence! our witchhunt against other thoughts and independence is making progress. I always told you, blaming others for your own inability to make money is the way to do it! This AFK-thingie has to be wiped out! But guess what, there aren't only people among us who make millions while beeing afk. There are players who make billion while not beeing logged in! That's the real cancer of EVE. - I'm talking about traders. Do you ever asked yourself why trader and traitor sound quite same? Now you know it. They are disgusting, shame on them! We know every one of us is a little sinner and I'm no exception. Once I tried to sell something. After a day I relogged in into EVE and saw the additional money on my account, what was so unspeakable horrible. Even today I can't look into the mirror to see myself. Shame on me too. Wake up and start killing traders. Eve shouldn't be a game where people can do what they want. They have to follow our democracy, if they want or not! in hisec if you are not afk you can mine with 100% safety because if you mine aligned (and alert ofc) every time you see on dscan the gankers you can warp away, but if you are afk bad things can come to you (also use the insta undocks/docks and so on, generally use your brain). The New Order state clearly they will punish afk miners because they can punish ONLY afk miners. So as you see it's very easy don't be afk and you are safe, totally safe. The rest it's just fun and tears. Thank you Kazacy, I like you. I know you don't believe me but I got it. EVE isn't about democracy or such sick stuff, it's an anarchy and those who own the power rule that game. Everything else is just propaganda to justify your actions. Like this whole blog including the comments. Anyhow, it's sad that we can't do anything against traiders. But wait, is that really true? Maybe attacking every transport ship in space? Peoples should be allowed to transport only one item, that's how we can distinguish between civilians and traders. So it's absolutely doable. We can do more than ONLY punish afk miners. What we are waiting for? Heh, interesting write up, made me laugh. But think about this, if it's difficult to "punish" afk traders, then they are playing the game correctly. Can't say the same about afk miners now, can we? Yes you are right. But I still think that the New Order can only reduce the amount of normal afk miners. The problem itself they can't extinguish. At least not by force. To program a bot that response on a local chat or a specific player who jumped into the same system is doable. Think about bots who let the ship automatically jump to a safe spot. Who sending a short message to the phone of the owner, so that he can send a short message as respond back while watching a movie. Or think about bots who send an answer back by it's own. You see there is this little thing called hope. Few months ago only one man (James 315 ofc), started this site and this movement. Now alot of people follow this movement and most of them literally discovered a new EVE, a new game way more funny. In time with a little luck, almost all miners will became a good EVE online players, meaning pvp-ers, and in the process they will also became a very good customers for CCP, because a good customer it's a satisfied customer not a bored one. The actual carebear customers try the game for a little while then they move on on the next trend; the player base of EVE are the players willing to learn and fight ingame not casual ones. Somehow at some level in CCP i hope they know this but the latest changes in game (aka nerfs, especially hisec pvp nerfs) ........ errrr nevermind maybe my hope it's foolish. Hope is never foolish and no one should ever lose it. But how do you think that only a pvp-er is not bored and why does this makes him a better cutomer? For CCP a good customer is a paying customer. If the customer bought the plexes with real money or botted ingame ISKs doesn't change that. Your opinion, that only pvp-er have fun is naiv. I don't like pvp and still have fun as you eventually noticed. What I also don't like is that you guys criminalize other players just because they have higher needs than watching her miners mine. Or because they choosed an other style of playing EVE. As a pvp-er you always have the choice to fight against an enemy who is stronger, what makes you dumb. Or fighting against a weaker enemy what makes you a coward. What you are suggesting is an EVE with only pvp players, like an ordinary shooter game. You should try Battlestar Galactica Online. But their customer service is bad. Really really bad. So please, don't try it! i could set up a droneship to fly into a lv1 mission and check up a few minutes later and expect rats to be dead... or i could actively run a lv4 mission. some elements of the game were made for players of different immersion levels. eve is a sandbox game. there is no way that any player could play the game incorrectly. If you choose to not play the game actively at your keyboard, then you should expect no safety. As you pointed out it EvE is a sandbox. 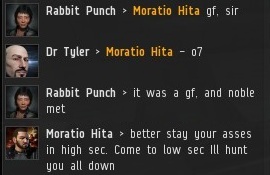 With that, I have the right to come kick sand in your face if I so choose under the game mechanics that CCP has allowed. If you're not at your keyboard, then you will pay the consequences. I'm not implying that you aren't allowed to do as you point out. You are however, not ENTITLED to be SAFE while choosing not to be at your keyboard while playing the game. The funny thing is no one is criminalizing other players for gamestyle (aka if you are a miner you are a target); the fact is when you choose to play eve there are consequences and usually pvp players accept these (aka at some point i will lose my ship wich is fine). On the other hand carebears (aka the risk averse players), don't want to accept these consequences and hence the tears, emorage etc. In the end if they choose to be the victims fine from me, but aparently it's not fine for them. "As a pvp-er you always have the choice to fight against an enemy who is stronger, what makes you dumb. Or fighting against a weaker enemy what makes you a coward." Sorry to say this but you don't get it again. Sometimes i fighted and won against stonger enemies (wich makes me dumb i know, but i can live with that) and all i get after the fight was a gf in local. On the other hand almost every time i ninja-ed or scammed some idiotic carebear (wich makes me coward i know, but i can live with that) the amount of tears, fanmail and emorage was epic. This is the reason every time i choose one sincere tear from a carebear over 100 gf in local from some pvp-ers. You should really try this and you will understand. you have the right to kick sand into other players eyes, but here you're trying to justify doing that. if you haven't noticed, high sec industrialism is all about being afk. it was intended to be a low cost, low return investment. now ccp allows you to suicide gank. that is primarily to ensure that haulers don't get in too much isk/volume ratio due to the high isk value of PLEX, which is unvoidable, but it's also a self-destructive action to ensure that suicide ganking low value targets doesn't become profitable. EVE was MADE to be played with the assumption that players intend to run a profit. there is little profit in ganking miners. therefore, if anyone is "playing the game wrong" it's you, who play it only for fun... and whatever "justice" james has convinced you is beneficial for high sec. "you have the right to kick sand into other players eyes, but here you're trying to justify doing that." Tbh i not trying at all to justify that; i really enjoy that, i pay ingame money to do that and i am not alone in that. 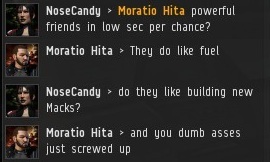 Also you make alot of assumptions about industrial side, afk, CCP, profit and so on. It's better to read the EULA and play the game within the boundaries of CCP; you don't have to build another rules in you mind and if they don't forbid that you are allowed to do that. Is very simple and trust me you'l have alot of fun. "now ccp allows you to suicide gank." You have ALWAYS been allowed to suicide gank in high sec. It's much harder to do it now than it used to be. "if anyone is "playing the game wrong" it's you, who play it only for fun..."
Let's nail it. Beeing afk while playing EVE is not a bad thing. It's part of that game and makes no one a criminal or bad player in and for EVE. Since I found no statement to the following point, I assume it's also okay to play eve as much as you want. Or are there any restrictions too? *Anonymous January 3, 2013 2:53 PM <- was my last post. Damn I need a name! WOW... EvE is 'Serious Business' taken to a completely insane new level. I really do pity someone who plays this game for any other reason than having fun. "WOW... EvE is 'Serious Business' taken to a completely insane new level. I really do pity someone who plays this game for any other reason than having fun." Aaaaaaaaaannnnd we have a winner!!! oh and Danks, you are aware that James doesn't gank for fun, he ganks FOR GREAT JUSTICE. there's a difference. right. "oh and Danks, you are aware that James doesn't gank for fun, he ganks FOR GREAT JUSTICE. there's a difference. right." Go AFK while docked up in a station duh. AFK in space and you are fair game. Whether you are in a battleship or shuttle. Please start with the station traders in Jita 4-4. Might be a bit hard since they never undock. "We have removed the distraction of mining. You are now free to focus entirely on your homework"
Well maybe the lessen has taught. Moratio Hita is currently enlisted with Amarrian Militia to fight against his mortal enemies. I hope he will find redemption while serving the Empress from his heart.